Earlier in the month, we introduced a feature to GOV.UK which allowed users to get a sneak preview of CSV files without having to download them. When we wrote about the change we promised to give you some early feedback on how well it was working. So here goes. We looked at the data for how the CSV preview feature has been used in the 20 days between 27 November and 15 December. 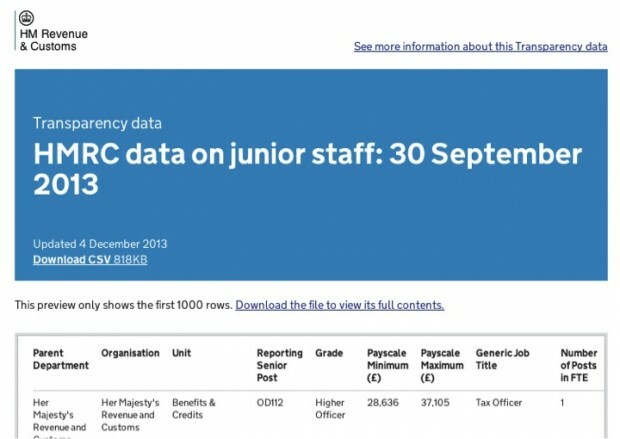 More than half (51%) of visitors to the most-viewed page, Senior posts in HMRC’s organisation structure, chose to preview the CSV. On the second most viewed page it was 47%. And across the GOV.UK site, CSV preview pages were viewed on more than 1,600 different pages, in 11,700 visits. Unfortunately, we don’t yet have the ability to find out how many users went on to download the CSV after previewing - that’s our next challenge. One of the benefits of having CSV preview pages with a standalone URL is that it makes raw data more findable in search. So we were interested to see that 15% of visitors to CSV preview pages came straight from a search engine. (That said, the vast majority of visits to preview pages came from users clicking on a link on the relevant publications page). Another advantage to CSV previews is that users also have clear onward routes to an explanation of the context of the data, which people who just download the data file don’t have. So it was also significant that of the people who arrived directly from search, 25% went on to look at other GOV.UK pages. We're going to continue to evaluate how CSV preview pages are being used and explore features such as filtering which will make them more useful. Stay in touch. Sign up now for email updates from this blog.